Located in northwest Wisconsin in what’s typically called the “Heart of the North” area, you will find the picturesque place called Barron County. From farm fields to forest, the Blue Hills to rivers, lakes and streams of all sizes, Barron County has plenty to offer people of all ages. The county is 30 x 30 square miles, and its cities include Rice Lake (Aquafest – June), Barron (Fall Fest), Chetek (Libertyfest – July), and Cumberland (Rutabaga Festival). Villages include Almena (Almena Fun Days), Dallas (Oktoberfest), Haugen (Haugen Fun Days), Prairie Farm and Turtle Lake (Inter-County Fair). A popular winter destination, Rice Lake gets its name for just that. A city located on the western edge of Rice Lake. The lake itself offers a wide variety of fun from winter car ice racing, to snowmobile trails, but let’s not underestimate the fishing opportunities that this lake has to offer. In the winter months, this lake has several different “cities” of ice shacks that decorate the frozen water. This is for good reason as the lake provides ample fishing opportunity for bass, bluegill, crappie, and northern pike. The southern end of the lake offers a deeper basin with plenty of areas to hone in on the panfish bite. The northern end of the lake also holds plenty of panfish, and is a great attraction to place out the tip-ups, and chase flags all day long as northern pike, and the occasional muskellunge take your presentation. The lake is also a main trail for snowmobile riders to connect to the hundreds of miles of snowmobile trails that Barron County has to offer. Rice Lake acts as the “hub” for the county with plenty of places to eat, sleep and shop. If competition is your thing, during the winter months of January and February, you can test your fishing skills at one of the ice fishing tournaments that are held on many of the local lakes. Aside from Rice Lake, the county has several lakes of all sizes and depth ranges to catch plenty of fish. 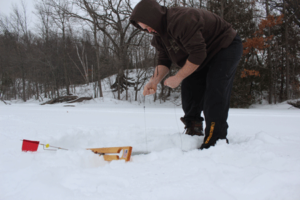 The winter fishing is popular for both walleye, and panfish. With lakes dotting the landscape, especially in the northern half of the county, you will have plenty to choose from to find a lake you like. There are 369 lakes to be exact. The walleye are very popular for early ice fisherman, and you will find them along the shorelines. Target the areas with rock, sand, and rubble. The sharp dropping shorelines with close access to deep water are go-to areas. Fishermen will set up tip-ups before dark, and fish into the night. The panfish bite is excellent as well. Many lakes have more fish than, “you can shake a stick at,” while others have less numbers but much larger fish. At early ice, the panfish like to hang around logs, cribs, or old weed growth. 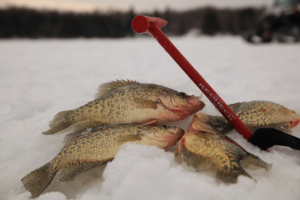 As the winter sets in, deeper holes in the lakes will hold the majority of the panfish. Likely, this is where you will find the small “cities” of ice shacks. Generally, the bluegill are active during the daylight hours, and you will find crappie fishermen drilling holes and setting lines as the sun fades. The crappie fishing can be excellent after dark so you can enjoy plenty to do outside during the day, and relax in a fish house and fish throughout the night. 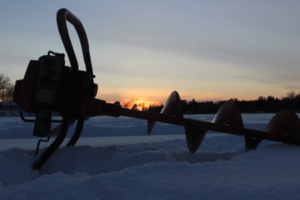 Barron County is a fun snowmobiling destination as it, not only, has hundreds of miles of trails that wind through farmfields, over beautiful lakes, and through the scenic Northwood’s, but it also connects to neighboring counties such as Rusk, Washburn, and Polk. You can ride for hours stopping along the way for great food and drink. The Tuscobia, Wild Rivers and Cat Tail Trails are the main snowmobile routes that connect to many other sections of trail opportunities. The Tuscobia Trail runs as far east as Park Falls, and the Wild Rivers Trail can take you all the way to the northern part of the state in Superior. If 4 wheels are your thing, Barron County offers almost 80 miles of 4-wheeler trails and opportunities. Located just outside of Almena, there is an area called the “ATV Playground.” This is an intensive use area, and wheelers can be brought here to break loose and have some fun. You can begin your ATV and snowmobile adventures in Chetek in the southeast part of the county, Turtle Lake in the western portion of the county, Cumberland in the northwest and Rice Lake in the northeast. Rice Lake offers many motels and restaurants adjacent to the trails. Barron County has even more opportunities to offer outdoor enthusiasts such as hiking, snowshoeing, cross country skiing and more. For cross country skiers, the Cumberland area ski trail association (CASTA) has 15 miles of trails for winter enjoyment. For more information on CASTA, visit their website at timberlandhills.com If you are in the Barron area, they also offer just over 4 miles of trails just south of the city of Barron. With thousands of acres of public land located in the county, you should have no problem finding an area you would like to explore. Snowshoe through the vast wilderness, snowy pine groves, over small lakes and ponds, through the tall oaks, and up and down the rolling terrain. Mountain biking is coming on strong in the county with what may be the premier single track trail being built in the Doyle/Pipestone Quarry Forest area, east of Rice Lake. IMBA (International Mountain Biking Association) and CORBA (Chippewa Off Road Biking Association) initially established the trail in 2015 and each weekend during the summer crews are working to lengthen it. With large tracts of public land available throughout the county, late season archery along with the small game seasons gives great opportunities to try some late season hunting. The public land has just about anything you could want from rolling hills, covered with oaks and maples, to lowland swamps and thick dense cover that hold deer, grouse and rabbits. It’s hard to beat a fresh snowfall in the woods. Whether you are hunting, hiking, fat tire biking or just viewing wildlife; the many trails, parks and abundant public land in Barron County have a lot to offer everyone. This year the Rice Lake curling club is celebrating its 50th anniversary. This is one of Wisconsin’s largest and most modern curling clubs and attracts curlers nationally. The Rice Lake curling club hosted the USCA Mixed National Championship in 2001, and has hosted other events such as the World Qualifier for the University Games, and the World Qualifier Senior National Championships. The club is a premier curling destination and holds several events all year long. It has brand new rocks this season, and it is a great place to curl. If history is to your liking, take in Pioneer Village. Tour through nearly 40 buildings. Five large display buildings, including a one-of-a-kind exhibition hall with forty glass-front display cases, filled with items from the distant past. Don’t miss the toy shop with antique pedal cars and toys of by-gone days. Be sure to view the five historic log buildings from the pioneer days. Take a leisurely stroll down Pioneer Street, and you will encounter an early railroad depot, country school, dentist office, doctor’s office, jail, saloon, blacksmith shop, newspaper office, library, meeting house, general store, post office and the historic Ebenezer Lutheran Church. 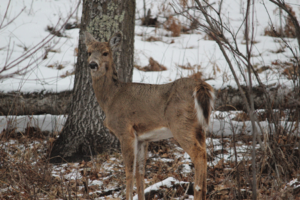 Article and pictures provided by Jordan Marsh, a freelance writer, photographer, and videographer from Rice Lake and owner of Marsh Outdoors. Editing provided by Dave Armstrong, Director of Barron County Tourism.